Over the past three years, there has not been much to write about on the Cubs’ international free agent front. In 2015-16, the Cubs exceeded their bonus pool and spent the last two signing periods under a hard cap and a $300,000/prospect spending limit. As a result, the Cubs were not able to sign much elite talent outside of Mexico whereby the Mexican club can be compensated well beyond the $300,000 limit. The Cubs have been mining that market as evidenced by last year’s signing list. 1. Now armed with a bonus pool of $4,983,500, the Cubs could do a lot of damage this summer. 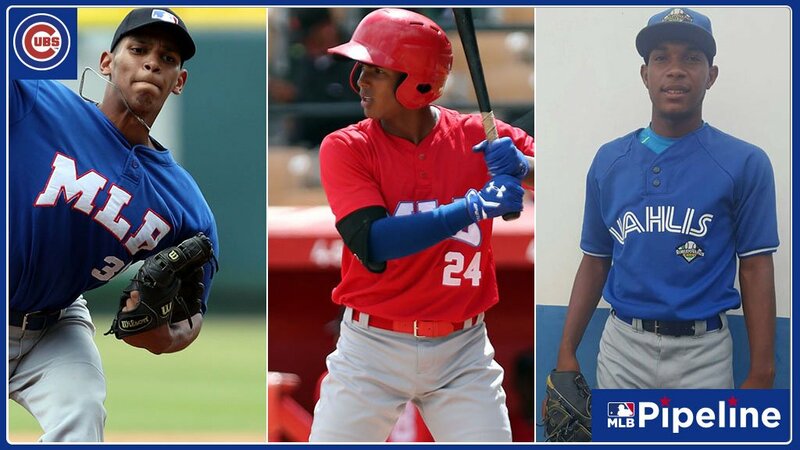 Although the official signing date of July 2 is 2 months away, the Cubs are already being linked to several young international players. Both MLB Pipeline and Baseball America have linked the Cubs to pitcher Richard Gallardo and outfielder Jose Lopez. 2. Gallardo is a 6’1” and 187 pound right-handed pitcher from Venezuela. Just 16, he can already throw in upper 80s and into the low 90s. He is said to pound the zone and is working on a curve. He was the star of a showcase a couple months as he just dominated for two innings. Baseball America raved about his abilities here. MLB Pipeline, who has some nice video of him in action, ranks him at #5 out of all international players. At the plate, the left-handed hitter has a small hitch but otherwise boasts a free and easy swing. The ball flies off of Lopez’s bat and he has shown the potential for more power in the future. He’s not as physical as some of the other top prospects, but he makes hard contact to all fields. The belief is that Lopez will be able to generate more power once he signs with a big league team and works on his mechanics in a club’s academy on a daily basis. Lopez has a chance to stay in center field and hit in the middle of the lineup one day. Check out a short video of said swing. 4. The Cubs are also aligned with lefty pitcher Joel Machado, who is is still growing. Ranked #28 by MLB Pipeline, I like that he has not reached his full physical potential and that he could add to his pitching profile as he matures. Scouts already noticed an uptick in velocity between growth spurts. Here is the sentence MLB Pipeline wrote that caught my attention: “He’s already able to spot his fastball to both sides of the plate.” That is pretty good for a 16-year-old kid who is velocity is changing. 5. Rafael Morel is a defensive minded shortstop the Cubs have also been linked with. At just 15, he could take a while to get to the states. 6. And I am sure there will be many more. The Cubs are known to sign over 30 prospects year, with or without the penalties, in the Theo era. With 2 teams in the Dominican, and now 2 in Mesa, some of the players might get an extra year to breakthrough into the states. What the new IFA market now becomes is a scouting contest as teams have a finite amount of money to spend. There is no more splurging, buying in bulk, and going over the bonus pool. I do find it sad that income is being restricted now with the bonus pool system. The July 2 date still should changes lives and fortunes for these players and their families. As for the Cubs, I am looking forward to seeing how the Cubs work this market to their advantage. Then again, that could take a couple of summers for it to shake out as these future Cubs won’t begin play until 2019…and they’ll only be 17.